Q: Can I drive on pavers? Q: Do I need ABC? 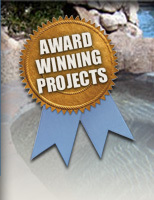 Q: Can I install pavers over my existing pool deck or patio? Q: In Arizona, are pavers too hot for my pool deck? Q: Can I pull up pavers if I have a problem? Q: Can you give me a ballpark cost for pavers over the phone? Q: What’s so great about pavers? A: Yes. Pavers have a minimum compressive strength of 8,000 p.s.i. – over three times that of concrete. Pavers look great but they also work. A: Aggregate Base Course. It is the base material that should be used under pavers. It is compacted and then sand is placed on top of it. A: Yes. ABC is an integral part of the paver system. Contractors sometimes don’t use ABC out of laziness, ignorance or because they are looking to cut costs. Over 80% of pavement failures are due to a lack of or no ABC being used. A: You do not have to seal pavers. There are situations where it is advisable. Ask us for our opinion specific to your project. We will give you an honest answer. A: If you have the space, you can. There are a full range of pavers in different thicknesses that can be used depending upon your situation. We will make a recommendation based upon what you have. A: We think so, if you are using dark concrete or brick pavers. 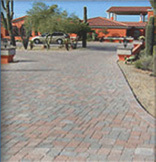 There are lighter colored pavers and different styles of pavers that work really well in Arizona. Artistic pavers, travertine or paver veneers work really well. A: Yes. But it is not as easy as you think. Call us if you need to pull pavers up. A: People have been installing pave stones since the Roman times. Those roads are still around. The system works if it is installed correctly. A:If you give us certain information we can give you a broad range but to quote you accurately we need to see your situation. No two homes are the same and no two quotes will be the same. A: Like bacon, pavers make everything better. Come down to our showroom and see our full range of colors, shapes and styles. You won’t regret it.